Dr. Maria Danilychev, MD is a truly unique practitioner of Reiki, who combines the intuitive sensitivity of this Japanese healing art and the respect for alternative medicine with a solid practicing background in Western medicine. Dr. Danilychev is a practicing Western medicine physician, board-certified in Internal Medicine, Geriatrics, Hospice and Palliative Medicine and as a Hospice Medical Director. To learn about Dr. Danilychev's medical background, please visit www.DrDanilychev.com. Dr. Danilychev has started her Reiki training in 2013 in San Diego, California and has received her latest Shihan (Master) certification in 2016 from Tadao Yamaguchi at the Jikiden Reiki Institute in Kyoto, Japan. 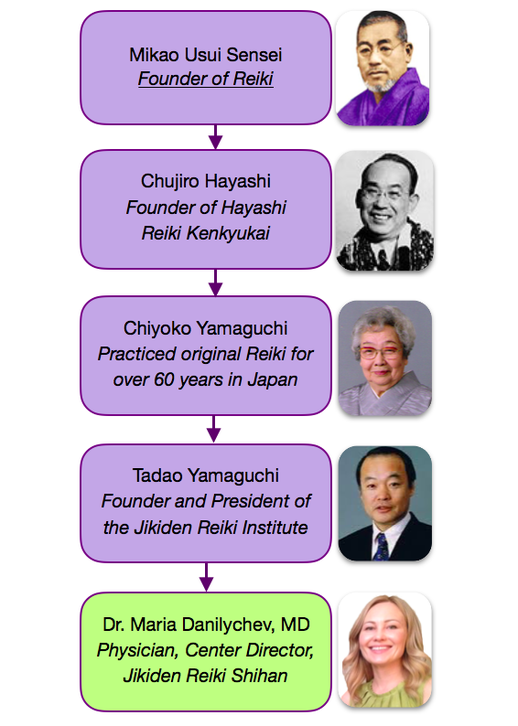 Below is the diagram of Dr. Danilychev's Reiki lineage, which outlines the doctor's training and her connection to Usui sensei through Hayashi Sensei and Yamaguchi Sensei. Dr. Danilychev is originally from Moscow, Russia, and has lived in the US since 1990. In 1996, Dr. Danilychev has graduated from University of California, Irvine with a B.S. in Biological Sciences and has obtained her medical degree (MD) in 2000 at the Tel Aviv University in Israel. Dr. Danilychev completed her residency in Internal Medicine at NYU DH in New York City and was one of the first responders during the 9/11 tragedy. ​After residency, Dr. Danilychev completed a fellowship in Geriatric Medicine at UCLA. Since 2004, Dr. Danilychev has been providing symptom management in end-of-life care in San Diego, CA. In addition to hospice work, she is also actively involved in clinical research. In working with hospice patients and their families, Dr. Danilychev has been recognized by colleagues and patients alike to be very empathetic in helping them on this difficult journey. While providing hospice care to her patients, Dr. Danilychev has observed Reiki and other complementary therapies in action, and has challenged herself to be become a Reiki practitioner. After doing extensive research into Reiki and its styles and subtypes, Dr. Danilychev chose to learn Jikiden Reiki because it has been passed on directly and unmodified from its founder Mikao Usui ('Jikiden' means 'direct' in Japanese). In addition to being very traditional, Jikiden Reiki training is quite rigorous and requires months and hundreds of hours of practice and extensive ongoing training. Although no style of Reiki is better than another, at San Diego Reiki we use Jikiden Reiki exclusively, since it is the style of Reiki as close to the original tradition as one can find today. come in for a FREE 30-minute consultation to meet the doctor and discover if Reiki is right for you. During this appointment, Dr. Danilychev will answer any questions that you may have, but no actual Reiki will be performed. ​CLICK HERE to book.